Economists mirror consumer survey: "Housing prices apt to fall much more"
"A group of 10 economists says that home prices in the United States are only halfway through their fall." "...and most of the further erosion should occur this year." Those predictions are consistent with consumer surveys conducted by The Real Estate Cafe and Boston Bubble six months ago (December 2007 & January 2008), which revealed that consumers expected housing prices to bottom out sometime in 2009 or 2010. When consumers in Greater Boston were asked to graph housing prices over the next 5 years (through 2012) in their local city or town, the composite pattern above emerged. A comparison of that table to the results of the same question asked two years ago (January 2006), reveals that consumer price expectations have taken a sharp downturn. 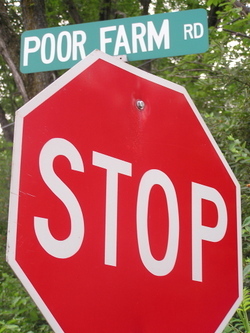 A recent report from the Federal Reserve Bank of Boston projecting that foreclosures may not peak in Massachusetts until the 2nd quarter of 2010, could send housing price expectations even lower. What's your prediction as we end the 3rd quarter of 2008? NOW, what do you think will happen to housing prices in 2008 & beyond? Please take a few minutes to update this survey of housing price expectations in Massachusetts after a week of negative housing headlines. This survey is being conducted independently by The Real Estate Cafe but we are eager to share the results with the press. 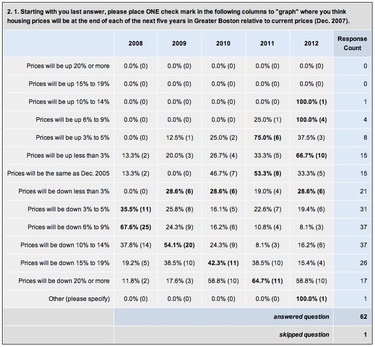 CLICK HERE, not photo below, to start survey: What do YOU think will happen to housing prices in 2008 & beyond? 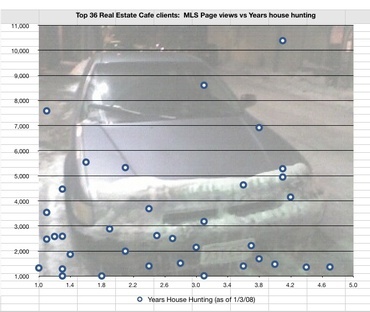 Thousands of MLS page views over 2 to 4 years: Will Bubble-wary buyers extend wait thru 2008? Temperatures in Boston are approached zero yesterday which, regrettably for this fee-for-service real estate consultant, was about the level of client billable activity over the Holidays. But that doesn't mean that The Real Estate Cafe's "do-it-yourself" home buyers aren't busy house hunting; to the contrary, 36 of them have looked at over 1,000 MLS pages online. As shown on the graph above, house hunts of 2,000 to 6,000 MLS page views stretching two to fours years are not uncommon. Can you imagine how long it would take to drive by that many properties, particularly in this frigid weather? That's why The Real Estate Cafe offers two MLS access systems, one which includes thousands of expired listings plus another map-based search with links to Zillow estimates. That's also why we're eager to invite new and long-time home buyers to network online and off in 2008. Regardless of whether you're a member of our "1,000 click club" graphed above, please join one or more of the subgroups on The Real Estate Cafe's new experimental social networking web site and exchange market insights with other clients -- particularly if you're in a long-term holding pattern. Our survey of housing prices in Greater Boston includes a few questions about potential educational and networking events, like our "Bubble Hour." 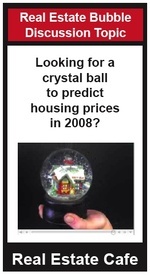 Please let us know what interests you and where you think housing prices are headed in 2008 and beyond. A local TV news department is working on a story today about the housing market, so The Real Estate Cafe and BostonBubble.com have volunteered to conduct a quick consumer survey to inform their reporting. What do YOU think will happen to housing prices in 2008 & beyond, and if you are in the housing market, how will that influence your home buying plans for 2008? The survey takes just a few minutes and we need your opinion AS SOON AS POSSIBLE to enrich tonight's TV news! Over the past three years, The Real Estate Cafe has blogged about the real estate bubble. Now we'd like to get YOUR opinion about what will happen to housing prices in Greater Boston and an update on your home buying plans for 2008. Right now, we're only looking for a few respondents to help us PRE-TEST our survey. Can you spare a few minutes? Your feedback will help us better understand the market and better serve home buyers like you. Eight months later, a survey of economists and the interview below on Marketplace.org, suggest that waiting could create more savings opportunities for homebuyers from what economists call a "negative cycle." How much have you saved by delaying your home buying plans over the past year or two, and how much more do you think you can save my waiting longer? How long will you wait, or will you be bargain hunting this Fall and winter as seasonal markdowns accelerate savings opportunities? 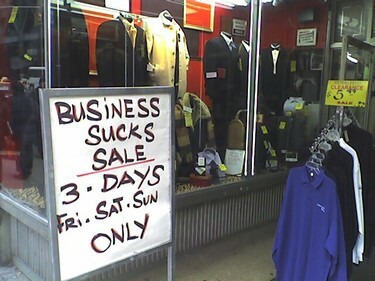 Marketplace host: You get the feeling that investors can't seem to make up their minds? ...Once emotions loosen the markets, where it all ends, can be anyone's guess. 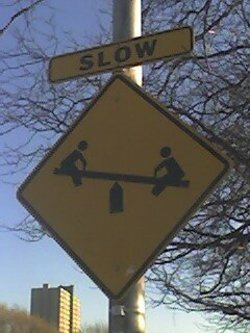 ...That has a lot of us in some kind of limbo these days. Steve Tripoli, Marketplace: Even well-healed potential buyers are thinking twice these days. Lois Vitt has written a book about real estate that focuses on buyer and seller psychology. She says "caution" is what happens when markets turn sharply south. Dr. Lois Vitt, author: Fear is contagious and that's what's going on right now. People are afraid. And so they worry that they might get in trouble if they go ahead with their plans and so people are holding back. Steve Tripoli, Marketplace: Nationwide chatter about a housing bubble, and further price drops isn't helping; even if it is accurate says Wellesley College housing expert Karl Case. Karl Case, housing economist: I've got a t-shirt that says, "Mr. Housing Bubble: I pop and you are done." There's just a lot of press, a lot of news about the mortgage market, about auctions, houses, about foreclosures. If you are in the market about to make a big decision about buying a large asset, that is going to scare you. Steve Tripoli, Marketplace: It's not only that a house is a big asset, says Case, but it's one most buyers will hold for a long time. Karl Case, housing economist: And they borrowed the money to do it. So they naturally have expectations about whether it's likely for it to go up or down, and it is clear that the demand is sensitive to those expectations. Steve Tripoli, Marketplace: The problem with this negative market psychology is that it can be self-fulfilling. Buyers hold back, prices drop; so more mortgages exceed the home's value, and prices drop more. Then buyers pull back even more. I asked re Karl Case and Lois Vit, "Are we are in danger of that kind of negative feedback cycle right now?" Karl Case, housing economist: Absolutely. Dr .Lois Vitt, author: Absolutely. Steve Tripoli, Marketplace: And all of the sophisticated computer models, and hedge fund managers in the world can't predict where that kind of negative thinking will take us. So fasten your seat belts. I'm Steve Tripoli for Marketplace. Asked to look five years into the future, 42 percent [of business economists] expected U.S. home prices to remain flat, 41 percent said prices should rise, and 16 percent predicted prices will fall. Only one in five of those surveyed predicted a "meaningful" recovery in U.S. housing markets before the second half of 2008. About 38 percent expected a recovery in the second half of 2008, while 42 percent said housing markets won't turn around until 2009 or later. If you are a home buyer, will the dismal survey findings above cause you to extend your house hunt by months or years? Or will you be bargain hunting this Fall and winter, as seasonal price reductions create attractive home buying opportunities? Join the discussion on our social networking site: Wait 2.0? Will dismal housing forecast extend househunts another 2 years?